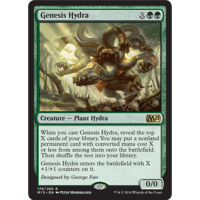 When you cast Genesis Hydra, reveal the top X cards of your library. You may put a nonland permanent card with converted mana cost X or less from among them onto the battlefield. Then shuffle your library.